I'm sitting at my desk watching the most recent snowfall (7 inches so far!) and thinking: What a funny time of year it is! Everywhere I look, people are bundled up, trying to stay warm. And, yet, in the past week, I've received several clothing catalogs, filled with bright-colored spring dresses and tops, and even the latest swimsuit collections. Meanwhile, New York Fashion Week, which will showcase fashion designs for fall 2014, is just a few days away. My head is spinning. Should I write about what's on the street, what's in the catalogs or what's on the runway? Well, my tendency is to report what I'm seeing on the New York City streets. And that's fur, fur, FUR! And there are several Adriene Landau faux fur bags for under $130 at Neiman Marcus Last Call . 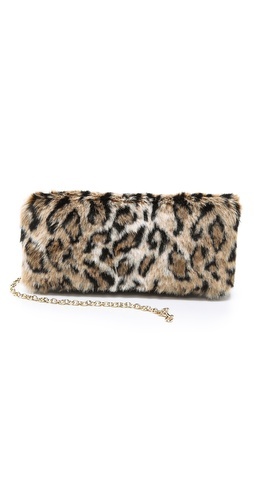 Finally, here's a Runway Leopard Haircalf Small Reversible Clutch (originally $195, now $77.99) (below) from DKNY. This one is more hairy than furry, but I love the two leopard patterns. You can reverse the pattern when the mood strikes you.